Hirda is the main source of livelihood for tribal people living in the Ambegaon block of Pune district, Maharashtra. People are engaged in various activities related to hirda such as collection, sun-drying and sells. Despite high production potential in the region, it is not utilized due to problems in supply chain, lack of awareness about its uses and low prices in the local market. NGO Shashwat working for various problems in the same region, requested RuTAG IIT Bombay for development of decortication machine to increase the efficiency of decortication after getting repeated orders from Pune from ayurvedic medicine manufacturing firm. This paper includes the study of actual production of hirda and production potential in 44 tribal villages of Ambegaon block. It also focuses on supply chain and value chain for better utilization of hirda by processing. The process of development of hirda decortication machine is also included as part of the study. 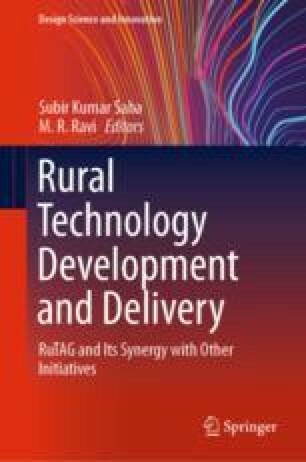 The authors are grateful for funding and support from the Office of Principal Scientific Advisor to the Government of India, for giving us the opportunity to work on the project under RuTAG IIT Bombay. We wish to thank Mr. Budhaji Damse and Mr. Dunda Jadar from the NGO Shashwat along with members of SHG at Gadewadi for co-operation and support.